If you’re feeling down about a recent job rejection this could be the story to turn your frown around. 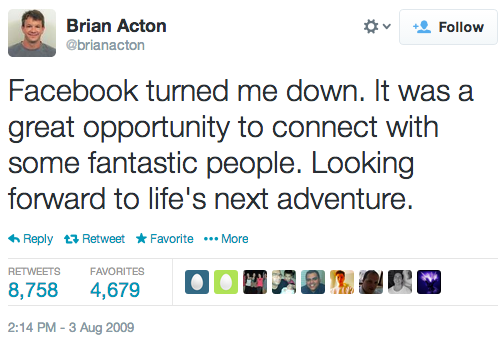 Have you heard of Brian Acton? Probably not. But chances are you’ve heard of the hugely popular app he co-founded in 2009 — ‘WhatsApp’. The story of how he ended up there, however, isn’t exactly conventional. In fact, it all started with him being rejected from his dream job. Brian's tweet quickly became popular on the internet due to his endearing optimism. Even though he’d had an impressive eleven-year stint working at Yahoo! he had been rejected by both Facebook and Twitter at the time of his post. While many would feel disheartened and lost, he instead took the time to share his positive outlook with others and his hopes for the future. As he soldiered on looking for work he eventually landed a job with an ex-colleague (someone he’d actually hired in his previous role). Despite not receiving any salary during the early stages of their work together, the deal soon paid off. Big time. Only a few years later Brian and his co-founder sold WhatsApp for a brain-melting $19 billion. Yes… that’s a ‘b’. At the ripe age of 40, Brian had proven to himself and others that not only does success not have an age limit but that optimism and self-belief can make all the difference when job hunting. His story is the ultimate example that career roadblocks can have an incredible silver lining. Who knows? Your latest job rejection could be putting you on the path to billions!